... Well, new old stock (never used, made in Brazil in 1984). A batch of Facit 1740s are on offer, probably for $100 apiece + shipping. Contact Dave Streko at dmstreko@verizon.net. Thanks to Dan Johnson for providing this information and showing us his machine here. It has some very unusual features. Yes, it's coming up yet again! I got smart this year and put it on my calendar, so there's no chance of it sneaking up on me unawares. Now I have plenty of time to be under-prepared. 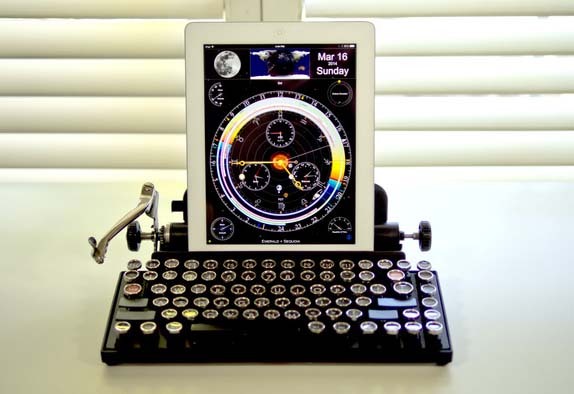 I think we're up for a little challenge this year, so by the power vested in me by Blogger.com's admin panel, I hereby declare the "theme" of Typewriter Day 2014 as Type Unconventional, and a more awkwardly-worded phrase I could not hope to have dreamt up. 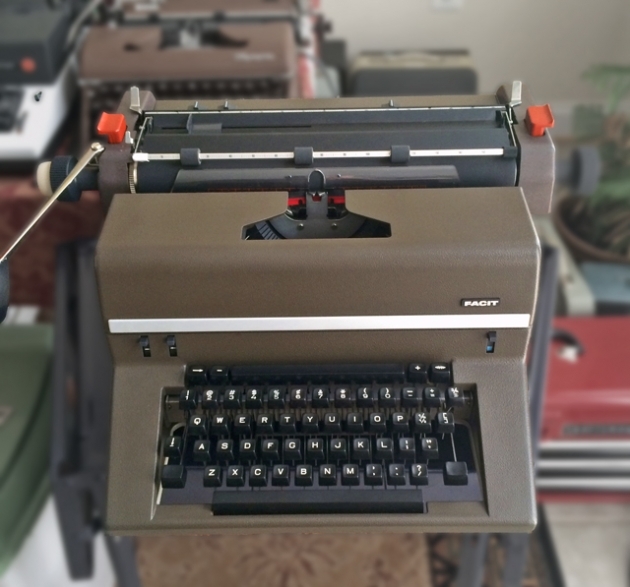 Your challenge, dear Typospherian, is to mark the passage of Typewriter Day -- Monday, June 23rd -- by using a typewriter in an unconventional manner: be that typing on something other than 20# white or even bypassing paper altogether or working with a broader palette than red and black. It may mean "extreme typing" a la the extreme ironing movement. Or heck, a whole art installation. These are just ideas, of course, and as stringent and strict as the 'sphere... which is to say, not very much at all. No judging, no prizes, just a chance to unbend your brain a little and celebrate Mr. Sholes' world-changing idea. I’ve never written a Dear John letter. The origin of the term is unknown, but the phrase became popular during World War II when wives and girlfriends in the United States had to write letters to tell their significant-other soldiers that they had found another man. I have not found another man, but I will be setting out to find another career. I don’t know what will happen to Project 88. I’ll be taking the old Smith-Corona home, and I’m going to come up with a way to use it wisely. A Smith-Corona is a very powerful friend. I want to thank everyone who became my friend through the mail. We did bond, didn’t we? Between March 17, 2013, and today, I have received 903 letters from 23 states and five countries. I have read and enjoyed every single one of them. They were smart, funny, poignant and displayed a level of heart that I never expected. Some of them literally made me cry. To all the people who came to the Ink and Bean, my Friday morning coffeehouse sanctuary, I’m glad we got to meet. I’ll try to continue my Friday morning tradition, so there’s still time to come by and say hello. I love that place. What did I learn through the mail? We all want to connect. We all wish we could find the right words. We all wish we could have people on the other end of our words who would accept them unconditionally ... and write back. We all appreciate the effort it takes to organize your thoughts, get them down on paper, find a stamp, find an envelope and put our emotions in the mail. We all want to say more than we can say in social media or even in person. Somehow, a letter, when it is done right, can convey so much more than some face-to-face meetings. The problem with typewriters and mail is, when you have hundreds of people you want to thank, there is no way to do it quickly. I made a list of names, and it got too long. I have a long file cabinet full of letters to which I wish I would have written back. Thank you for trusting me with your prose. And I’ll let you in on a secret ... I used a typewriter, but the typewriter wasn’t what Project 88 was all about. Our correspondence was never about the machine, but rather the heart brought out by the machine. It was loud and old and cool and unimportant in the exchange of ideas. I got great letters in pencil. I got a letter written on toilet paper. I got calligraphy. People mailed me books and old photos and confetti. It got so good, I got addicted to my mailbox. Just after 9 a.m. every day, I would start looking over my shoulder for the mail cart. I would get to the mail cart before the person who sorts the mail. Some of my best correspondence came from jail, and I could usually tell from the penciled markings in the return addresses if it was going to be a good letter. And now I’ve got to write an ending, and I don’t have a good ending.